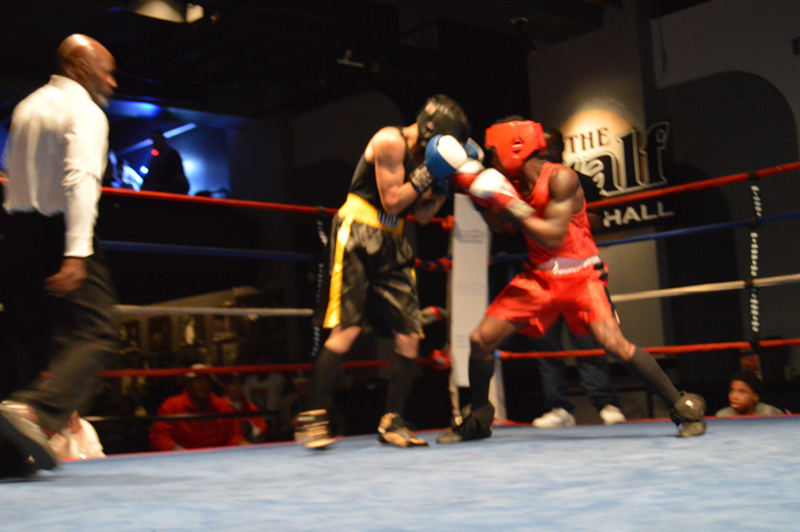 The first round of the Upstate New York amateur Golden Gloves tournament returned to the cozy confines of the Tralf Music Hall in downtown Buffalo Saturday night. A total of 44 fighters competed for the chance to advance into the next stages of the tournament, to be held in the coming months at the Tralf. It was a good night in particular for the fighters of Westside Boxing, whose fighters went 3-1 with two knockout victories. The West Ferry Street gym’s Jeffrey Nygayot was especially impressive against the seasoned Mike Vega of Niagara Falls’ Casal’s Boxing. Nygayot came out guns blazing in rounds one and two of their lightweight tilt, overwhelming Vega with volume punching and slipping deftly underneath Vega’s attempts to counter. In the third round, Nygayot sealed the unanimous decision by falling back to a jab, dashing in and out with shorter combinations and staying out of reach. The old stick and move. In the dressing room after the fight, Nygayot explained that he boxed that way in the third round because he was getting tired, and sustained a bruised rib in sparring that he was concerned about. Nygayot, whose real name is Gerffred Nygayot Olingou, said his family emigrated from Congo to Buffalo when he was toddler. The Oracle Charter School graduate got into boxing when he as 14 thanks to a member of his church: pro boxer Anges Adjaho. Olingou stated this was his third time through with the Gloves, and finds time to train in between his job and his studies at Buff State. Gold stars were also awarded from this corner for the performances of Curtis Chaplin (178 pounds) of Ultimate Fitness in Syracuse and the Northwest Buffalo Community Center’s Akhmed Aliyev (141 pounds). Both fighters were able to separate themselves from their very good opponents by utilizing their fitness with a dash or ring smarts. Aliyev, a Golden Gloves vet at age 20, looks to have stepped up his game since last year’s tournament. The fight of the night, however, goes to Buffalo PAL’s Fredrick Thomas narrow decision over UB Boxing’s Max Braun. It was an excellent contrast of styles: Braun being taller and lankier with Thomas more squat and powerful. The decision after the customary three rounds could have went either way, but Thomas rightfully edged Braun by landing more and better punches. There was a more active than usual crowd at the Tralf for the fights, and it included current local prospects Greg Brady, Pinky Colon as well as the Old First Ward’s erstwhile lightweight contender Irish Jackie Donnelly.